One in a series of Mathematics Wall Posters for Primary, Middle School and High School classrooms, addressing all Common Core Standards concepts. 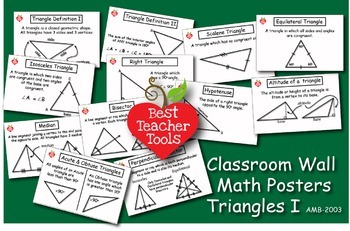 This set of wall posters are designed to display in an uncluttered manner, basic introductory concepts in Triangle Geometry. Suitable for lower grades and as a review resource for other grades. - 300dpi 11x17inch Jpgs and Png clipart. This product comes as PDF file, in 300 dpi hi-res 11x17 inch landscape format. It can be printed on any printer either in you school, or at commercial vendors. You can also print in smaller formats as well such 8.5 x 11 letter size. These posters are perfect for lamination for long term use. All rights reserved ©2017 AMBillustrations and BestTeacherTools.